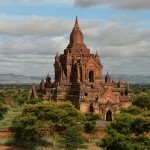 The great spire was erected by Anawrahta and later encased within a slightly bigger one by Kyansittha. 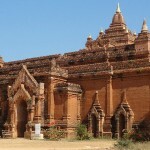 This is one of the four edifices in Bagan built wholly or partly of stone. It is said that in building this pagoda, volunteers stood in three rows over the seven miles’ distance between this site and Tuywin Mountain quarry to relay the stone bricks. Shwezigon is a veritable museum of old crafts and culture. The ft-high elongated bulb just under the Hti or umbrella is made of Pyuisa Lawha, an alloy of five metals gold, silver, bronze, tin and lead.The inner one, merit of Anawrahta, is also made of the same alloy. 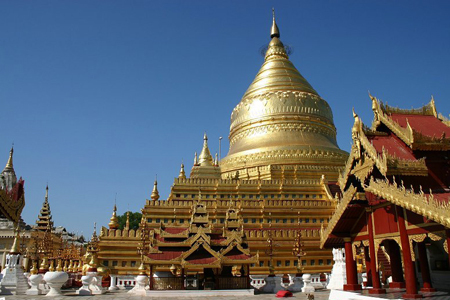 The three terraces are lined with green-glaze clay plaques showing the Jataka scenes in relief There are 26 bronze bells at the Shwezigon, two donated by King Bayint Naung of the 16th century Hanthawaddy Kingdom (present- day Bago), founder of the second Myanmar Empire. 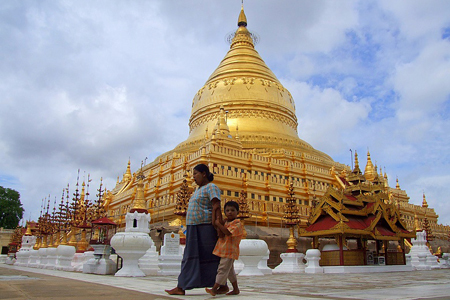 One of the bells detailed the building of his palace in Hanthawaddy; the other listed his donations to the Shwezigon Pagoda, including covering the spire with pure gold leaf. On each compass point there is a pavilion with a 13 ft-high standing image, also cast of Pyinsa Lawha. It is said that ancient artisans could cast images with this alloy in such a way that the gold in it will settle on the face. There is also a pavilion with carved and painted wooden figures out of the Jataka Tales; the four figures of the aged, the ill, the dead and a monk that caused Prince Siddhartha, the Buddha-to-be, to reflect on his life and leave the palace and a shrine with two father and son Spirit images. In a separate shed there are ancient Spirit figures. Some of these represent Spirits that are still worshipped today but the figures have changed dramatically. Huge ancient timber walls with carvings of dancers and musicians can also be seen.